Although these feelings of remembrance are now used to commemorate the fallen of all global conflict, it was indeed the First World War (1914-1918), or “The War to End all Wars”, that inspired these heartbreakingly eloquent words and forever enshrined the memory of a lost generation for all time. 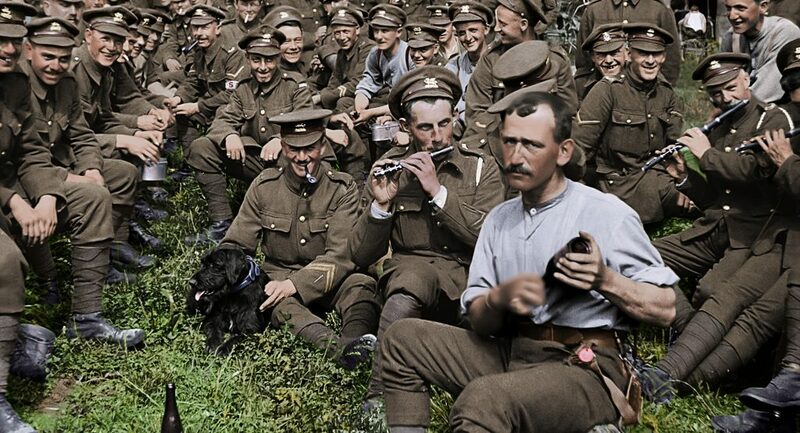 With this spirit of remembrance and in further recognition of the centenary of the 1918 Armistice comes the latest directorial effort from Peter Jackson, in They Shall Not Grow Old, a striking, immersive and emotionally powerful documentary feature, unlike anything we’ve ever seen before. Audiences have seen plenty a documentary on the War, as well as films, television shows, and countless other forms of literature, and so one may ask what can Jackson and his team really offer that has not been portrayed before? But this is not simply another recitation of statistics and ideological geopolitics, but an immensely personal and technically ground-breaking work of cinema, that is both visually stunning and incredibly emotionally intelligent. Using only the narration of actual veterans alongside images of the War (soldier training at home, trench life, battle scenes, and graphic stills of the dead and wounded) we are presented with a literal front row seat to this calamitous war filled with the personal anecdotes of those who were there; there are no historians, children of veterans and other service members speaking, only the people who knew the realities of the Western Front firsthand. From the tales of food shortages and diseases in the trench, the horrific smell of death all around, and the struggle to find understanding amidst all the chaos, these stories are all the more poignant as they are juxtaposed with images from the front lines. This is not your typical black and white, grainy old footage, however; indeed it is the utterly magnificent restoration and colorization of this 100-year-old film that truly makes these stories jump to life. So striking and beautiful is the restoration, that for the first time we see the Great War not as something from a textbook but as a contemporary and very real struggle. SO STRIKING AND BEAUTIFUL IS THE RESTORATION, THAT FOR THE FIRST TIME WE SEE THE GREAT WAR NOT AS SOMETHING FROM A TEXTBOOK BUT AS A CONTEMPORARY AND VERY REAL STRUGGLE. Jackson has thus created a brilliant resurrection of the past in such vivid detail, it hardly seems that the men and voices we see and hear existed 100 years ago. In one scene a group of soldiers is shown hiding in a ravine, likely awaiting orders to attack, and the scope of the emotions on their faces tells the whole story; later in a post-credits commentary we learn that that particular footage was the last film ever shot of those men, who were all killed just 30 minutes after being filmed. With this vivacity it becomes even more saddening to think that all these individuals who are shown (with all their loves, fears and emotions) have now passed on, but forever leaving their marks on us. Sifting through close to 600 hours of film footage of the war and interviews with veterans, Jackson and the crew were met with a massive undertaking, yet took on the challenge with an immense reverence. 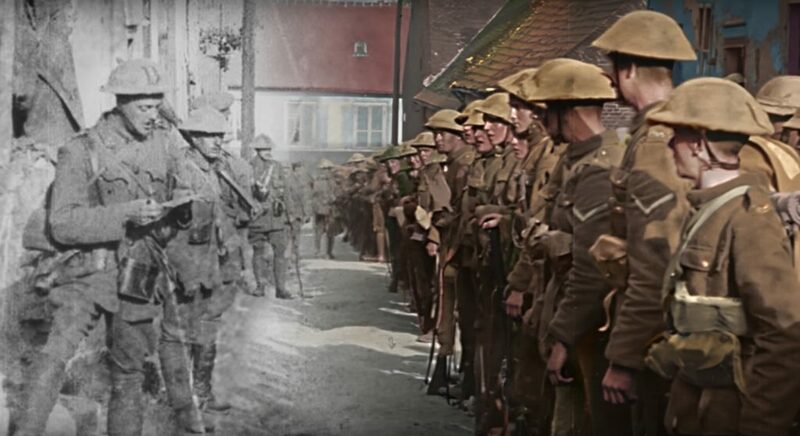 The meticulousness is not just in the coloring and restoring this footage, but also in adding authentic sounds, speeches from the soldiers (determined by lip reading the silent film), and adjusting the frame rate from reels of damaged film, what has been accomplished technically in this movie is an absolute marvel in every sense of that word. It is a breathtaking and graphic depiction of events in a way we could never have imagined. Perhaps reading about the piles of young men massacred could provide a vivid image for some, but with this film, it’s clear no imagination is needed to realize the raw brutality of this real-life butcher shop. With these amazing testimonials (which are also occasionally amusing, “When will we have strawberries? !”) supported by footage long thought to be unusable, They Shall Not Grow Old relies on the soldiers themselves to greatly humanize the First World War; although it is told through the perspective of British soldiers only, we can assume that the universal human emotions felt by these young men would be the same for the German and other enemy sides, and so the stories and graphic shots presented really don’t belong to just the British, but to all who lived, died, and ultimately survived.